what do you think about this ribbon bar? Could it be IDable? I think the third ribbon could be BMV4XmKr and the fourth ribbon a BMV4X. The sixth ribbon looks like the Swedish Order of Swords to me. The silver swords and the different blue stripes rule out an Austrian Order of the Iron Crown. The ninth ribbon could be a pre-war BMV4. Possibly Major a.D. Johann Pöllmann who had the Swedish Order od Swords 3rd class, Bayern Jubilee, and Ludwig. Any record of Pöllmann having the Bavarian Military Merit Order without Swords (pre-war)? It's not listed in the 1914 Rank List. In 1900 and 03 he was at the artillery depot in Fürth. His swords and crown were from WWI, October 9, 1916. He is not listed in the Ehrenrangliste so I can't determine. I am referring to the 9th ribbon (without swords). I would expect this to be listed in the 1914 Bavarian Rank List, and it is not. 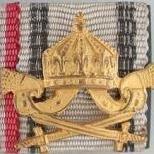 The 9th ribbon is the Bavarian MVO4 without swords, which was only given out untill 1914. If you didn't have it in 1914, you would never be able to get it anymore due to the dissolvation of the Bavarian kingdom. That is the reason it has to appear in the 1914 ranklist. Pöllman did not have it in 1914 so possibly the wrong guy.